The 400 series is just as reliable as the 200, with even greater heating capacity at up to 390,000 btuh. 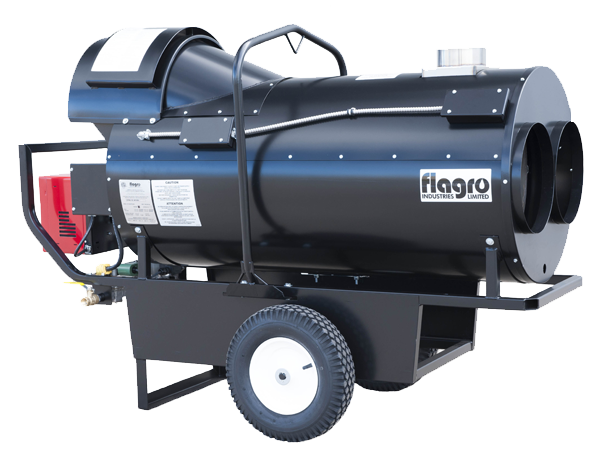 The 42 gallon tank on the FV0-400 can run for up to 14 hours, burning just 2.75 gallons per hour. FVO-400 weighs in at 450 lb and has two 16" pneumatic wheels. The FVN-400 (natural gas) and the FVP-400 (propane) weigh 365 lb and require external fuel tanks. All three models measure 70" long x 29" wide x 52" high. They come with two 12" air outlets and an optional third 16" outlet. L x W x H 70" x 29" x 52" 70" x 29" x 47"
Gas Pressure 2.0 U.S. GPH at 170 PSI 2.0" W.C. The solution to your heating needs is just a phone call away. Call our "Hot Line" today!